"I've been a member of Hit The Mic Backstage since Stacey launched. If you're looking for incredible resources, easy to understand training, a vibrant community, and a top notch expert to help you, you can't go wrong with this membership. Talk about getting HUGE value for your $$ -- this is it!" 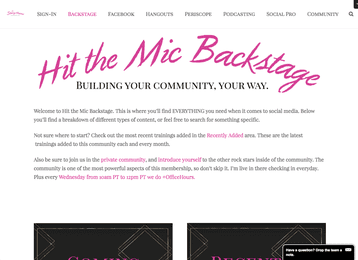 "Hit the Mic Backstage is the ultimate resource for growing your business. Stacey is accessible and helpful for any specific advice and the membership site has any training you might need for social media or techy bits."